Almost a decade after the start of the global financial crisis, the world economy is still trying to achieve escape velocity. The IMF’s recent forecast for global growth is a disappointing 3.1 percent in 2016 and 3.4 percent in 2017. And the outlook remains clouded by increased economic and political uncertainty, including from the impact of the Brexit vote. Policymakers have taken forceful macroeconomic policy action to support growth, such as fiscal stimulus and appropriately accommodative monetary policy. But a lasting recovery remains elusive. What needs to be done to rev up the global growth engine? The world’s largest economies need more structural reform. This was a key theme at the G-20 meetings this past weekend in Chengdu, China, and has in fact been a major focus of the G-20 under the Chinese presidency. The IMF’s April 2016 World Economic Outlook has also highlighted the key role of structural reforms in boosting economic growth, specifically the impact of labor and product market reforms on growth in advanced economies. And a new staff paper pulls together our specific structural reform recommendations for G-20 countries. There are many different areas in which structural reforms —or measures that make the institutional and regulatory framework more supportive of economic growth—can help boost productivity. These include labor and product market regulation, trade policy, taxation, and the financial sector. With so many potential areas to work on, how should policymakers prioritize their efforts? First, the economy’s level of development helps determine which reforms are likely to have the greatest productivity pay-off. In advanced economies, reforms that foster innovation. In emerging markets, reforms that improve the way markets function are likely to matter more.Second, the economy’s position in the business cycle also matters. The weaker the economy, the more important it is to choose reforms that will support growth in the short term andthe long term. Infrastructure investment is a good example—it boosts growth today, through investment and job creation; and it boosts growth tomorrow, by improving productive capacity. The state of the economy can also make a big difference for the impact of structural reforms. For example, in good economic times, labor market deregulation can make employers more willing to hire new workers, which boosts growth. But if the outlook is poor, deregulation could actually lead to job losses in the short term, because it will be easier to lay people off. A third important consideration ismacroeconomic policy space. As I just mentioned, some structural reforms will be more successful when economic prospects are looking up. So demand support can be critical for enhancing the impact of structural reforms. Such support can also help offset possible short-term costs of supply measures. For example, extra support for those who become unemployed as a result of labor market deregulation can be critical. The benefits also work the other way around—some structural reforms can help increase macroeconomic policy space. Labor and product market reforms that increase competition and lower prices can create space for monetary easing. Structural reforms can also help generate space for discretionary fiscal policy. Measures that boost growth in the medium term will also increase tax revenue. These together—higher output and higher revenue—will lower the ratio of public debt to GDP down the road. So this helps increase fiscal space today. 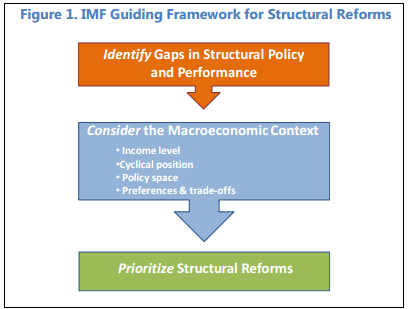 At the IMF, we are using the framework explained above to guide our policy advice. In advanced economies, we are focusing on measures that raise both short- and medium-term growth. These include recommending that countries like Australia, Canada, and Germany increase public spending on infrastructure investment. We are also recommending reforms that help broaden full-time employment opportunities for women in countries like Canada, Germany, Japan, Korea, the UK, and the US. Where policy space is limited, for example in Italy, product market deregulation is particularly recommended for raising investment, employment, and output without generating budgetary costs in the short run. Interactions across these different reforms are also factored into IMF advice. For example, tax simplification and broadening measures in the U.S. can reduce inefficiencies, generating revenues to finance other high pay-off (but costly) reforms. Given that most emerging markets are in weaker economic condition and have limited fiscal space, we are focusing on structural reforms that can also deliver payoffs in the near term. These include better management of public investment processes in India, product market reforms in China, and labor market reforms in South Africa. Our recommendations also address trade and FDI impediments—for example in Brazil, India, and Indonesia—as well as governance of public institutions and other institutional reforms. Where fiscal space is limited or consolidation is necessary, we are encouraging governments to adjust the composition of fiscal policy to make it more growth-friendly. Ahead of the Hangzhou Summit this September, G-20 member countries are making new structural reform commitments. To ensure maximum impact, policymakers need to implement them as part of a comprehensive policy package, with demand and supply policies complementing each other. And to ensure inclusive impact, they must be supported by policies that cushion those who may suffer short-term costs under these reforms. For reforms to be effective, they need to benefit not just some, but all.